Because we believe, for the reasons set forth on the main Herbs directory page, that growing spice plants for seed is not wise gardening, we will not be updating this page—but, for those who disagree, the information here should suffice. To avoid confusion: there are three main types of plant called “fennel” (which they all are): “Florence fennel”, or finocchio, a type with a greatly enlarged bulb meant for use as a vegetable; common fennel, a wild plant of little culinary use (sometimes called “bitter fennel”); and “sweet fennel”—what we are dealing with here—a plant grown mainly for its seeds used as a spice, but also, like all its Umbellifrae kin, edible from top to bottom. Fennel “seed”—which, as with several other “seed” spices is actually a fruit, not itself a true seed—is one of that fairly large class of more or less anise (or “licorice”) flavored condiments (which include anise itself), and is used in many national cuisines. Home-garden seed catalogues rarely distinguish sweet fennel cultivars save as “green” and “bronze”, distinctions which deal only with the appearance of the growing plant, not the “seeds” (which are fruits). 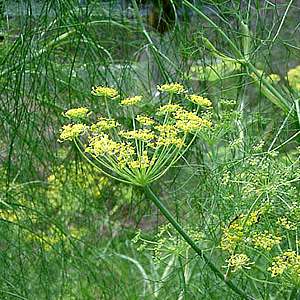 (So-called “bronze fennel” is sometimes listed as Foeniculum vulgare ‘Purpurascens’). One university source stated that the types—bronze, green, and various cultivars of each—all taste much alike. But it’s not like we have a lot of choice anyway. Fennel can be planted either in early spring or in the fall. The plant generally makes it through winter with no trouble, so seeds can even be planted in late fall to get the plant growing very early in spring. Fennel reportedly takes about 80 days before the stems reach full size, then “a few weeks” more for the seeds to form. If we call that 100 days, we can probably sow our fennel hereabouts anytime from early to late May for harvest around the end of August. The general rule for herb and spice plants is that their soil needs are not demanding, save that the soil must be very well-drained: few herb or spice plants can stand “wet feet”. The soil should not be particularly rich, most especially not for flavoring plants we grow for their seed (or fruit), common mis-advice to the contrary notwithstanding: a rich soil will lower the concentration of the “aromatic oils” that give the seed its characteristic flavor, which is the very thing we are growing them for. Plants that are slightly nutrient-stressed (which doesn’t mean starved) give better-tasting seed. Fennel generally follows that pattern; but the crucial thing to know about fennel is that you do not want it growing close to any other plant, and most especially nowhere near other members of the Umbellifrae family, which is a large one. It inhibits the growth of most plants, and readily cross-pollinates with its kin to give useless results on both plants. Grow it by itself off in a corner of the garden, or in pots placed well away from the herb bed (and your carrots). Be aware that fennel, like its close kin, develops a pretty long taproot. Just plant the seeds about ¼ inch deep in lightly moist soil. One gardener commented that the stuff grows so freely and vigorously that it could probably crack through concrete (a remark not to be taken literally). As with virtually all seed-spice plants, keeping watering down concentrates the wanted flavor in the seeds. At harvest, fennel needs the usual care of seed-yielding plants: keep a close eye on your crop and harvest plants individually, lest the heads shatter prematurely, or loosely secure a permeable mini-bag (cheesecloth or old row-cover pieces) around each seed head to collect any premature seed releases. When a plant is ready—the seeds have start to turn brown—cut the plant. Hang cut plants to dry over a catch-cloth; when they are thoroughly dry, dump them into a holding bag (which you will later use for threshing them). When your crop is fully harvested, thresh the lot: beat the holding bag in which you have collected them against a hard surface to dislodge the seeds. Sift the loose seeds through a 3-inch mesh hardware cloth to remove the chaff. Make absolutely, positively sure the seeds are thoroughly dried before putting them away for storage (in the usual manner for dried herbs and spices: an airtight container stored in a dark place, preferably a cool one). You loaded this page on Friday, 19 April 2019, at 16:45 EDT. It was last modified on Monday, 4 February 2019, at 03:15 EST.